St. Joseph’s N.S. has become a ‘Digital School of Distinction’, joining a growing group of primary schools nationwide to receive the prestigious award. Ciaran Cannon T.D. presented the award to teachers and pupils at the school. Supported by HP and Microsoft, ‘Digital Schools of Distinction’ is a flagship award programme which promotes, recognises and encourages best practice use of technology in primary schools. 1,504 primary schools around Ireland have registered for the programme, with 240 schools receiving their award to date. 18 other schools in Galway have received the award and 107 registered to sign up to the programme. The Digital Schools of Distinction Award aims to help schools to further integrate technology into the classroom. 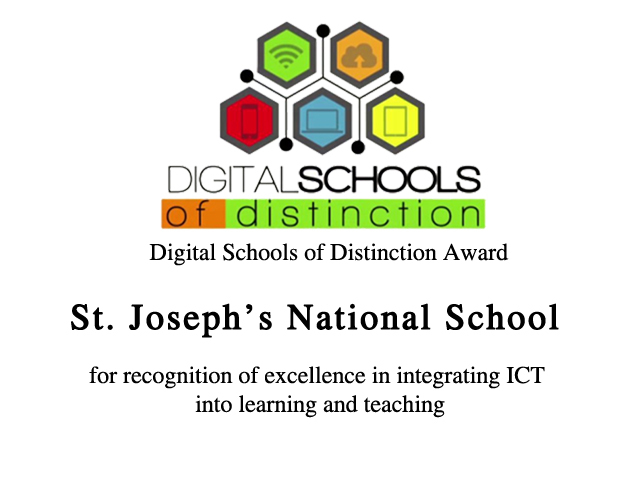 Schools who register and who are successfully validated through the programme are awarded Digital Schools of Distinction status by the Department of Education. The response to the programme from primary schools has been extremely positive. Dominic Gallagher, Principal of St. Joseph’s N.S. said that the programme offers a great opportunity for primary schools to build on their digital capabilities: “This award is a recognition of the ongoing digital culture in our school and the development of both pupils’ and teachers’ digital literacy. The use of technology is evident in every subject and classroom and is in line with our aim that every child should be enabled to use technology to enhance their learning and equip them to become lifelong learners. We are delighted to be part of the Digital Schools programme and we are confident that this award will be just the springboard to launch us into the next level of our digital journey”. Technology is integrated seamlessly throughout St. Joseph’s National School. Pupils share their experiences and learning daily through their own blogs and class twitter accounts. Pupils have regular timetabled access to the laptop room which they use for blogging, coding, research and educational games. Each classroom is provided with a laptop and an interactive whiteboard. Classes engage in Mystery Skype calls, Quad Blogging, 100 Word Challenges, virtual author shows and many other activities. St. Joseph’s N.S. very successfully participated in the recent national MATHletes challenge, ranking as top school in Galway and Connaught and 6th primary school overall in Ireland. For more information on the school’s use of technology, visit www.kinvarans.ie. New digital schools receive a Digital Schools Classroom Kit, to include free printing for a year via a HP OfficeJet Pro printer, a monthly printing allowance of 200 colour pages and 2,000 black and white pages, and Microsoft software and educational apps as well as technical support services. The Digital Schools of Distinction programme is supported by the Department of Education and Skills in partnership with Dublin West Education Centre, the Professional Development Service for Teachers/Technology in Education, the Computer Education Society of Ireland (CESI), the Irish National Teachers’ Organisation (INTO) and the Irish Primary Principals’ Network (IPPN). Digital Schools of Distinction is delivered through a public private partnership in association with HP and Microsoft in Ireland.